Russell Anderson and Barry Robson have agreed new deals to stay at Pittodrie. 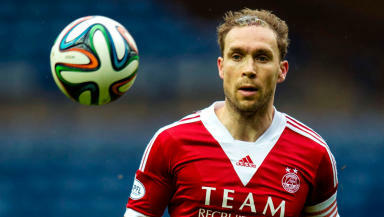 Russell Anderson and Barry Robson have signed new one-year contracts to stay with Aberdeen. 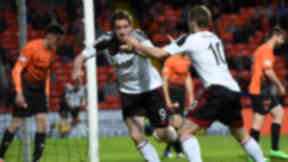 The defender and the former Scotland midfielder have extended their stay at Pittodrie after helping the Dons claim the League Cup in March. Nicky Low has also signed on to stay for the 2014/15 Scottish Premiership campaign after making 17 appearances this term. Manager Derek McInnes told the club's official website: "All three have made important contributions to the season just finished and I'm looking for them to play their part in the progression of the club next season." However Josh Magennis, Scott Vernon and substitute goalkeeper Nicky Weaver have not had their deals extended. McInnes added: "I would like to thank all the above players for their contributions to the club and wish them all the very best in their future careers."